JAPAN: Sharp, Sony down as TV troubles continue, but Panasonic's back in the black | What Hi-Fi? The latest financial results from three of Japan's biggest consumer electronics manufacturers show mixed fortunes, with Panasonic moving back into profit while Sharp and Sony losses exceed even pessimistic expectations. But there's a common theme from all three companies – and that's the problems they have making TV technology make money. After recording its worst ever annual financial loss in the year ended this April, Panasonic moved back into the black in the period from April to June, making a net profit of ¥12.81bn (£105m) against a loss of ¥30.35bn (just under £250m) in the same three months last year. And despite revenue down 6% year-on-year at ¥1.815tn (£14.9bn), operating profit improved to ¥38.6bn (£303m), seven times 2011 levels. A major factor in the turnaround, which is being greeted with cautious optimism by Panasonic executives, was the slashing of costs in its TV division, including writing down huge losses from its investments in plasma display manufacturing. Good news? The company is now making money on the TVs it sells. Bad news? It's still losing on the panels it makes for both its own sets and those for other manufacturers. However, the company remains committed to the more wide-ranging changes it has instigated, moving Panasonic further away from low-margin consumer products, including TVs and into more profitable market sectors including solar panels and rechargeable batteries for automotive use. It's also shifting focus away from consumer electronics – where quarterly sales were down 20% – towards its more successful 'white goods' operations, making products such as refrigerators, laundry appliances and air-conditioners. Sony increased revenues 1.4% in April-June, to ¥1.515tn (almost £11bn), but lost ¥24.64bn (£202m), compared to its April-June 2011 losses of ¥15.5bn (£127m). It's still struggling to halt the losses in its TV division, which has been in the red for four years, while moving its growth plans away from television to more profitable mobile products such as smartphones and tablets. Sales in the Home Entertainment and Sound division, which includes TV, were down 26.2% year on year at ¥251.8bn (£2.07bn), although losses weren't as great as in the same three months last year, at ¥10bn (£82m) against 2011's ¥13.6bn (£111m). However, its mobile division, on which so much hope is being placed, could also be doing better: having ended its joint venture with Ericsson, and making it a wholly Sony business, mobiles clocked up sales of ¥285.6bn, and losses of ¥28.1bn. However, Sony's woes are a mere fraction of those at Sharp, Japan's largest TV manufacturer, which celebrates its centenary next month. It lost ¥138,4bn (£1.14bn) in April-June, compared with a loss of ¥49.2bn ((£404m) in the same three months last year. The company, which made record losses in the 2011-12 financial year, wrote down ¥14.2bn (£116m) for restructuring its LCD panel business, plus ¥15.86 (£130m) to settle a lawsuit brought by Dell regarding overcharging for display panels. 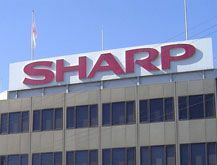 Sharp now expects to make much larger losses in the current financial year. From earlier predictions of a net loss of ¥30bn (£246m), it now expects to find itself at the end of next March with losses of ¥250bn (£2.05bn). That's better than the ¥376.08bn (£3.09bn) loss it made in 2011-12, but still means tough times ahead for the company. Those steps will include the loss of around 5000 staff, or about 9% of its worldwide workforce, by the end of March 2013.